Regarded as one of the great automotive engineers of the twentieth century, Ferdinand Porsche is well remembered today for his remarkable automotive designs including the Volkswagen Beetle and Auto Union Grand Prix cars. Yet there is another side to his extraordinary career, for he was an equally inventive designer of military vehicles and machinery. In this field too he excelled. Indeed the sheer versatility of his contribution is astonishing. Karl Ludvigsen’s study is the definitive guide. He tells the complete story, focusing on Porsche’s relations with the German armed forces and on the stream of advanced designs he was responsible for. Included are Austro Daimler’s pioneering aero engines, the Kübelwagen, Schwimmwagen, Type 100 Leopard tank, Ferdinand or Elefant tank destroyer and the astounding Type 205 Maus tank. He also describes Porsche’s creative work on aero engines, tank engines and even a turbojet for the V-1 flying bomb. Karl Ludvigsen’s account confirms the preeminence of Ferdinand Porsche as a brilliant and prolific engineer, one of the most remarkable of his generation. Karl Ludvigsen is a world-renowned and prize-winning historian and author with over fifty books to his credit. He has made in-depth studies of the cars and histories of Volkswagen, Corvette, Porsche and Mercedes-Benz as well as the careers of leading Grand Prix drivers and designers. A former vice-president of Ford of Europe, Ludvigsen has had a life-long interest in engineering and military history. Among his most notable publications are Porsche: Excellence Was Expected, Battle for the Beetle and Colin Chapman: Inside the Innovator. "...hard to put down...The author has given us a eminently readable but learned treatise on a less known aspect of one of the greatest engineers of the twentieth century. The illustrations are well chosen and nicely reproduced, fitting the text and thus adding to the interest...with the added bonus of being written by Karl Ludvigsen it is a must have. Buy a copy and spend a day reading it, it is really hard to put down. Most enthusiastically recommended." ...fascinating book on an unusually fascinating man, who's name is still a household word more than half a century after his death... This book doesn't shy away from what may best be considered the "dark side" of Porsche's life and times; the dealings with the Nazi's, and his relationship with Adolph Hitler, nor the use of slave labor in the factories manufacturing his products. In-fighting among the "personalities" who ran the various industries and manufacturing plants is well described, as is Porsche's less than cordial relationship with Hitler's Minister of Armaments and War Production; Albert Speer. Kudos to the author for a job well done on such a complex subject! "If you believe that Karl Ludvigsen has already illuminated all aspects of the Porsche brand and person, now this book arrives that deals with the less-known military designs. A comprehensive bibliography and index complete a work that is not just intended for those interested in automobiles." "Readers will have come to expect lavishly produced and thoroughly researched books on Porsche from Karl Ludvigsen but this latest work from the Suffolk domiciled authority on all things Porsche takes the reader along a slightly different road in that it describes the talented engineer's work on military projects rather than motor cars. ... This is a book that is hard to put down, especially for anyone with an engineering bent. The author has given us an eminently readable but learned treatise on a less known aspect of the work of one of the greatest engineers of the twentieth century." "I must say this book was not what I was expecting. It did not tell the story of the legendary sports car designer and manufacturer that we are all familiar with, but one of an innovative and forward thinking engineer, who was an active and influential part of the German 'War Machine' during both world wars. His design of the VW Beetle was not a surprise but his significant involvement in Aero engines, Marine engines, Tanks and even the V1 flying bomb certainly was. Ferdinand Porsche's relationship with Adolf Hitler, post war arrest and subsequent imprisonment as a suspected war criminal also came as a suprise...this book will appeal to not just those with an interest in engineering, but also those with an interest in the history of the first half of the 20th Century." "We're all familiar with Ferdinand Porsche's automotive design work, but an oft-forgotten side of his career saw him designing many military vehicles. This book is a fascinating look at his work for the military, which spanned the first half of the twentieth century through both the First and Second World Wars. [It] chronicles Porsche's work for Adolf Hitler as one of his most trusted designers, where he was responsible for vehicles such as the Kubelwagen, the Schwimmwagen, and the Type 205 Maus tank. Porsche's work on aero and tank engines, and his involvement with the V-1 flying bomb, are also covered." "A sobering account of a difficult time." "Professor Porsche's Wars is illustrated with over 200 images and is an in-depth account of Porsche's little-known career as a military engineer during both World Wars. It features details of Porsche's relations with the armed forces of Austria-Hungary, and later Germany under both the Weimar regime and Adolf Hitler's Third Reich." "…crammed with information, original photographs, illustrations and drawings, we reckon it's an essential addition to any military vehicle enthusiast's reference library"
"...I am very glad indeed to at last have Karl Ludvigsen's take on Professor Porsche, both the engineer and the man. The research here is of the highest order, as is the avoidance of any sentiment or editorializing. Taken with his other books on related subjects, we Porsche enthusiasts have a fairly complete picture of what it meant to be Ferdinand Porsche. You won't have to be a dedicated war buff ( I certainly am not) to make reading this one entirely worthwhile." 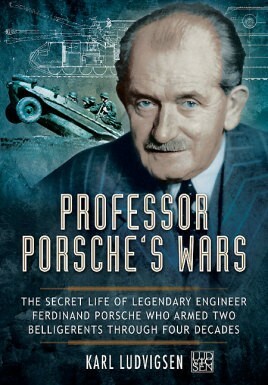 "…isn’t just for auto enthusiasts who might anticipate the usual car-driven story: it's for any who want to know another side of Porsche's life: his work as a designer of military vehicles and machinery…The result is just now a "must" for transportation collections, but a top recommendation for military history holdings as well. "It is in no small measure thanks to Ludvigsen’s previous efforts on his epic Porsche biographies that he both found material relevant to this new book and also forged a relationship with someone in a position to significantly advance the story, Porsche’s oldest grandson Ernst Piech. The book is well illustrated, including some patent and other technical drawings... has a larger format of 8.5 x 10.75″... The Bibliography is quite wide-ranging and certainly shows that this new book enlarges the picture." "engrossing… scrupulously researched…epic industrial history." "Karl Ludvigsen, one of the most notorious Porsche authors, digged deep into the archives of Porsche, Mercedes and some military libraries, and wrote the complete story of Ferdinand Porsche’s military engineering history. Even though this is not about the history of the sportscar that bear the Professor’s name, this part of his life makes an integral part of the provenance of the Porsche brand, whether you like it or not. A true Porsche enthusiast truly won’t regret to read the book....Together with the other books Karl Ludvigsen wrote about Porsche, this makes a wonderful addition to any Porsche Library"
"The fact that Professor Ferdinand Porsche designed military vehicles is well documented but, inevitably Porsche biographies tend not to dwell on the subject before launching into the more glamourous part of his story, and the bit that sells books in large numbers: the cars. As a long time Porsche enthusiast I was confident that I had a pretty good vision of Porsche's contribution to military ordnance and thought of it as significant, but a somewhat intermittent undertaking. But Karl Ludvigsen's latest book surprised me by showing that the Prof was rarely, if ever, without a military project on the drawing board...one would have thought that there was little that could be added to the Porsche story that had not already been covered ." "Fascinating and irresistible, a perfect gift for anyone interested in military vehicles...Ludvigsen has created a book that justly deserves considerable praise for drawing the attention of historians and military enthusiasts to the story of Professor Porsche." "Author Karl Ludvigsen presents general interest readers with an examination of the life, engineering and design prowess, and wartime contributions of German automotive giant Ferdinand Porsche. The author has organized the main body of his text in eighteen chapters devoted to Porsche’s introduction to the military, his work in advancing aviation power for Germany, his work with Adolph Hitler, and a wide variety of other related subjects. The author is a former Vice President of Ford of Europe and an independent historian and scholar." "...fascinating and meticulously researched book, Karl Ludvigsen investigates the genetic spiral that gave Porsche cars the character of weaponry."